Vígi(?) and Halfdan(?) and Eilífr (and) Hákon (and) Rúnfríðr had the stone erected in memory of Illugi(? ), their father. Œpir carved the runes. This was very annoying. 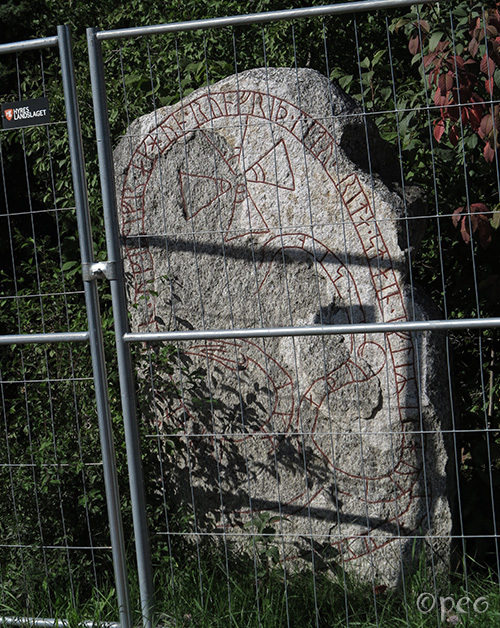 A fence had been temporarily put up on a small area right in front of the rune stone, and that made it impossible to take a decent photo of the stone. Otherwise it's in a very fine state, and it was carved by runemaster Œpir. I'll be back in a year or so, to take a "fenceless" photo.